Last night I finally built up enough courage to re-tackle our guest bathroom's hardware after I failed miserably at my first attempt. My boyfriend helped me this time around and even though this second attempt came with its own set of tiny nightmares, we successfully installed the hardware! I'm so happy the install is over with but I am rethinking the knobs I added to the cabinet doors. They look a little itty bitty compared to the bulky bin pulls. What do you think? I do love the bin pulls though! 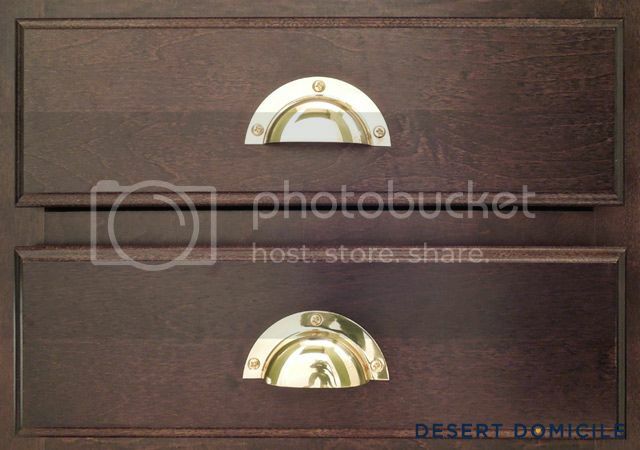 I love how the brass hardware looks against our chocolate cabinets. The next item on our bathroom's to do list is a mirror. I've been looking but finding a large mirror that's a minimum of 40" wide for a decent price is pretty hard! We may end up framing out the basic builder's mirror that was previously in the room because A) it's huge and B) it's free. I just need to figure out how to fit a frame over mirror clips. Anyone have any ideas? You can have your mirror cut down by a professional company for very little $$. Good luck. I find large framed mirrors on CL all the time. Did you try that? yeah the knobs needs to be much bigger, they look kinda awkward compared to the pulls. gorgeous! love the shininess and love the cup pulls! and yeah, i think the knobs look a little tiny, too. i could see you doing some funky geode style knobs there as well. Glad you got it to work! We've framed two bathroom mirrors both w mirror clips. Wood frame we chiseled off the back a little. Tile frame I just added extra grout around it to make it less pronounced. Both look great! Ooh, those cup pulls! the brass looks so good against the dark cabinets! the little ones do look tiny...I wonder if they'd grow on you over time (ha! grow on you. probably not literally). I love those bin pulls to death! 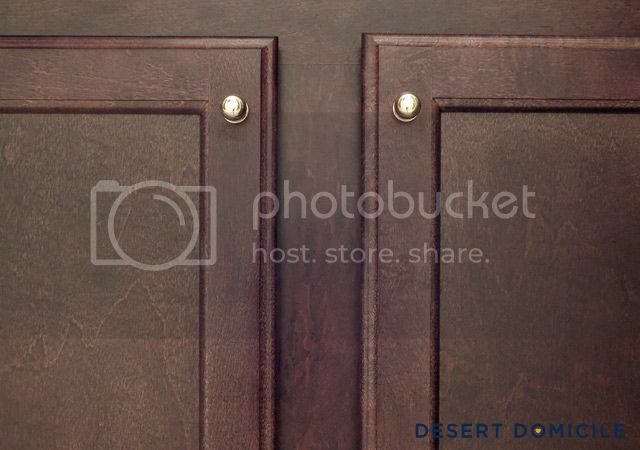 I'm thinking larger knobs would look nice on the doors though. I'm planning on doing bin pulls & knobs in our kitchen and I hadn't thought about the scale of the two together, so now I will take that into consideration as well! Those Ikea handles would be killer in brass! ooo that hardware is dreamy! 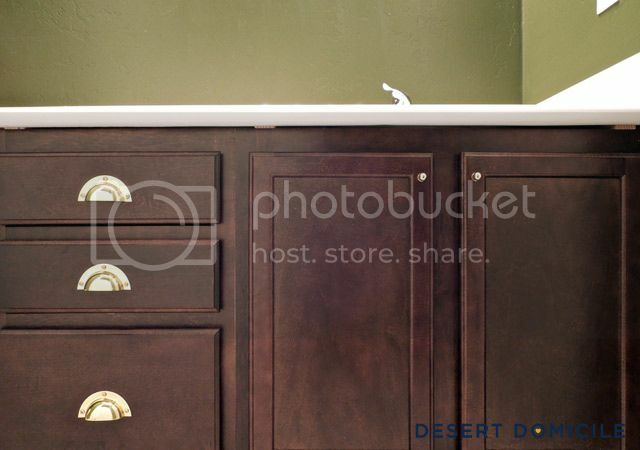 i;ve never framed a bathroom mirror...however that is my plan for our guest bath...because we already have it. Someday! Love the pulls. 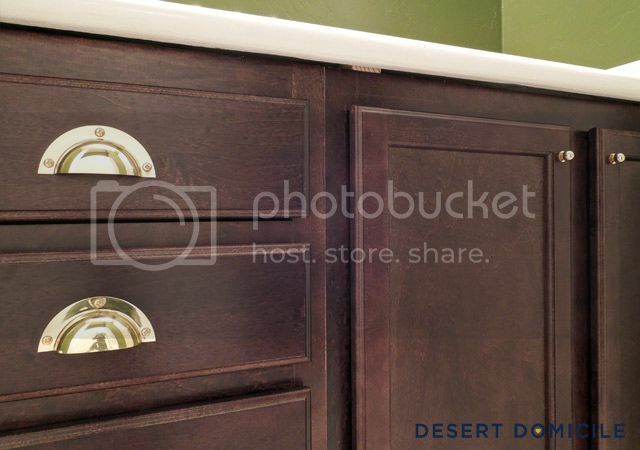 And I agree, the pulls sorta dwarf the cabinet knobs. May be something to keep in the back of your mind since they're still functional as-is. Ooh, I love the big pulls! I agree with you...the knobs look a little unbalanced. Overall, the room is looking great!! I loooooove the pulls. They look so great. I don't hate the knobs, but I sort of agree that they look small in comparison. But those pulls are show-stoppers. Great choice on the hardware! Especially love those cup pulls! They are so pretty!! I'm glad you got them on!! Looks gorgeous! 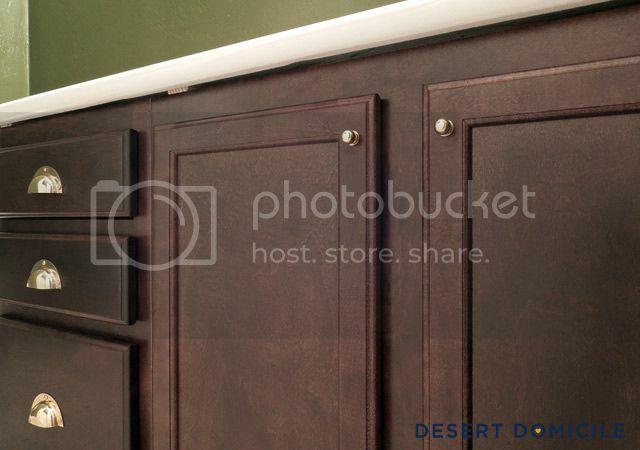 I have a question- do our cabinet pulls need to be the same finish as our faucet? 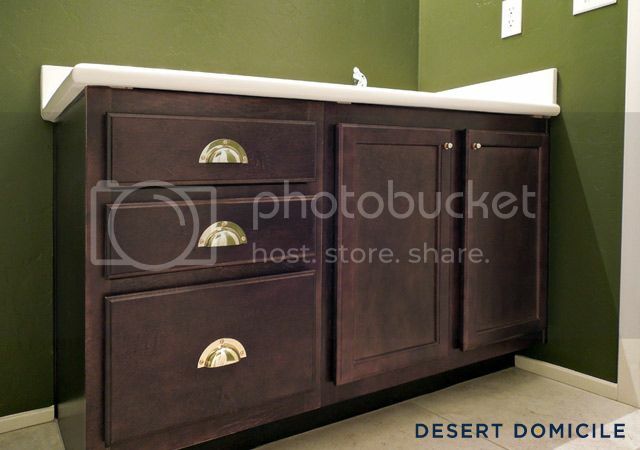 For instance, I LOVE the ones you have, but I don't know I've ever seen a faucet this color. Thoughts?